Without generous donations and a grant match from Cleveland Climate Action Fund the Art of Nature summer program at Collinwood Friends Garden would not have been possible! THANK YOU! With the funds, we were able to employ high school students from Cleveland School of the Arts to plant and maintain a portion of the Collinwood Friends Garden. They participated in the Garden Walk Cleveland event and in October they will participate in the Freshtober cooking contest at Tri-C. They are well prepared this year since they were able to take cooking classes from Chef Kayla Wiley. A digital copy of the recipes they learned will be available at www.facebook.com/collinwoodfriendsgarden. Students also participated in painting classes. 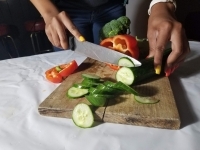 This was a launch for a special project from the kitchens of CMSD- CSA students will donate paintings promoting healhy eating to elementary school cafeterias across the district. Thank you to the Eagle's Club Aerie 2259 for the deeply discounted hall rental to hold our classes! It is hard to believe how fast this summer flew by, but we are celebrating with a back to school supply give away in support of Collinwood Reads literacy initiative! Stop by the garden on August 8th from 6-8pm while supplies last! Fifth district community engagment officers will also be giving us a helping hand. Happy harvesting to my fellow gardeners and cheers to a great 2018-19 school year to students and teachers!